Nissan Motor Co., Ltd., yesterday announced, in Tokyo, the launch of the Nissan GT-R, a new multi-dimensional performance machine that lives up to the concept of “an ultimate super car for anyone, anywhere, at anytime”. The Nissan GT-R features a newly developed Premium Midship package, including the world’s first independent transaxle 4WD developed independently by Nissan. 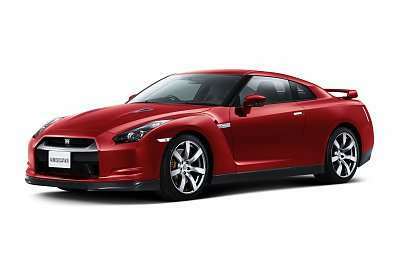 The Nissan GT-R will be available in Japan mainly through Nissan High Performance Centres from 6th December, 2007. The Nissan GT-R was developed with a understanding and appreciation of the forces which are an integral component of creation – gravity, inertial force and aerodynamics – and translates those forces into a completely new design, maximising tyre grip and airflow. Taking these factors into account, Nissan designed the all-new Nissan GT-R, which offers advanced high performance for secure and enjoyable driving by minimising the effects of climatic, road condition or driving technique limitations. The Nissan GT-R offers ultimate performance for virtually every driving situation – whether it be the Nurburgring circuit, to snow, rain or urban areas – all manageable by the GT-R driver through advanced technology and driving dynamics. The Nissan GT-R’s unique characteristics are instilled not just in the vehicle’s design, but also through a specialised production process. Carbon fibre, aluminium and steel components are assembled with a special high-precision process, which includes a series of vibration tests. Engines and transmissions are assembled by a single craftsman in a “clean room” environment and upon completion, every GT-R undergoes a battery of comprehensive tests to ensure the proper operation of all vehicle components. To properly support the all-new GT-R, Nissan has established special Nissan High Performance Centres in Japan, where all certified advisors and technicians have received extensive training. Total support for the GT-R owner is offered for the first three years of ownership, including measurement and adjustment of the engine, transmission and wheel alignment after the first 1,000 kms, and again every 12 months, free of charge. The all-new Nissan GT-R uses a Premium Midship package, an all-new, more advanced version Front Midship (FM) package utilised on other Nissan vehicles. This new package enables the use of the world’s first application of an independent transaxle 4WD system. The transaxle’s layout places the dual-clutch transmission, transfer case and final drive at the rear of the vehicle (instead of the usual front location), which enables vehicle weight to be evenly distributed throughout the car. This gives the Nissan GT-R a superb front-to-rear weight balance, while enhancing leg and foot space and allowing for an optimal pedal layout. Under the bonnet, the Nissan GT-R features an all-new 3.8-litre twin turbo V6 “VR38” engine, featuring plasma-sprayed bores and a special twin-turbo exhaust manifold system. A secondary air management system enables the newly designed powerplant to provide approximately 40 kg/m of torque during ordinary low-rev driving, which gives an optimum air-fuel ratio for around-town efficiency and helps the Nissan GT-R meet ultralow emission vehicle (U-LEV) standards in Japan. The Nissan GT-R’s new engine produces 353 kW at 6,400 rpm and maximum torque of 588 Nm from 3,200 to 5,200 rpm. Putting the power to the ground is an all-new GR6-type dual clutch transmission, with paddle shifting and a Borg Warner six-plate dual clutch for direct control. Suspension duties are handled through a special Bilstein DampTronic*1 system, which utilises all pertinent vehicle information to provide appropriate damping forces for all situations and helps maintain a high level of control for straight-line driving, cornering, and braking. Braking is essential for a daily-driven super car and the GT-R features large Brembo full-floating drilled rotors, low steel high stiffness brake pads and Brembo mono block six-piston front and four-piston rear calipers, which in combination minimise fade and provide stable braking. Run-flat tyres, exclusively designed for use on the Nissan GT-R, balance high grip and all-weather capabilities and a comfortable ride in all driving situations. The tyres are designed to maintain structure for 80 km of travel at 80 km/h, while still providing an acceptable level of performance. The Nissan GT-R offers a long list of safety and environmental features, including, for enhanced visibility inside and out of the vehicle, high-mounted LED stop lamps, bright LED rear combination taillights, “super wide beam” headlights, heated door mirrors and flat-blade wipers. Standard safety equipment includes a pop-up engine hood system for enhanced pedestrian safety, driver and front passenger SRS Air Bag System, ELR front seat belts with tension reducer, front seat belts with load limiter and three-point ELR rear seat belts. Disappointingly though, driver and front passenger SRS Side Air Bag System and SRS Curtain Air Bag System are only offered as options. Environmental technologies include extensive work to provide an U-LEV certification in Japan for the 3.8-litre twin turbo engine and reduced levels of volatile organic compound for materials used in the car. The Nissan GT-R’s styling follows the function over form theory. Every styling aspect, from the overall design to the smallest details, is designed to maximise the vehicle’s driving experience – as well as suggesting GT-R’s “super car” level of performance. Utilising advanced aerodynamics, the Nissan GT-R’s aggressive styling evokes the lines of a well-trained athlete, combining strong character lines with smooth and solid areas. The all-new GT-R’s body is manufactured with a combination of steel, carbon fibre and aluminium, providing a unique combination of stiffness and lightness. The Nissan GT-R features a low coefficient of drag of 0.27, with high front and rear downforce, which provides the GT-R with enhanced grip in all weather situations, while also enhancing fuel efficiency. The front guards express power and stability, while the “aero-blades” on the guards’ leading edges provide optimum airflow around the tyres and along the body. The scoop in the guards’ trailing edges assists in providing front downforce and optimisation of side airflow. The aggressive front end, with a large bonnet budge and single air intake, provides a sophisticated style as well as undisturbed airflow for power and cooling. New “super wide beam” headlights feature three additional sub-reflectors (compared to conventional lights) to give a wider spread to the illumination area. The Nissan GT-R’s large, four-passenger cabin features a sloping “aero blade canopy” roofline and curved C-pillar “sword edge,” which expresses the distinctive GT-R identity, as well as facilitating air flow around the rear of the vehicle. The GT-R’s hallmark four-ring tail-lights, efficient rear spoiler and large, integrated exhaust tips, provides the signature rear view of the GT-R, as well as optimising airflow along the top and under the vehicle. The high level of advanced technology is evident even in the Nissan GT-R’s paint – which utilises a “double clear coat” and “anti-chipping” process. The Nissan GT-R features Ultimate Silver as a special new colour, which is pain-stakingly hand-polished by craftsman. Key to the Nissan GT-R’s usability as a both a 'daily driver' and a high-performance super car is its interior, which is designed to balance functionality, a sense of ease, and comfort. Sculpted performance bucket seats give the driver and front passenger a comfortable driving experience, and soft pads are utilised on the dash in front of the passenger and doors to give an extra level of comfort and safety. The instrument panel surrounds the driver, with all meters and multi-function meter at a uniform height to minimise the driver’s head movement when traveling at high speeds. A large centre-mounted tachometer, with gear display on its upper right, as well as the easy-to-read graphics of the display, gives the driver instant detailed information, essential for the performance nature of the GT-R.
Functional style is also evident in the Nissan GT-R – each meter features a dial plate design that evokes the idea of engaged gears, as well as a three-dimensional metal-like ring, suggesting the multi-dimensional performance of the GT-R. A large, metallic framed centre console features the ergonomically designed shift lever and a red “engine start” button. Adjustability is central to the daily-driver nature of the Nissan GT-R, with a special “set-up switch” located in the centre of the instrument panel. This switch enables the driver to adjust transmission shifts, shock absorbers and the Vehicle Dynamic Control (VDC-R) in three settings – Normal, Comfort or R, the high-performance setting designed for the Nissan GT-R “super car” application. A high-speed, high-capacity CARWINGS (Japan market) navigation system, with a powerful 30 GB hard disc drive, features an easy-to-use touch pad, as well as traditional navigation switches. The screen interface features not only the navigation system, but also an enriched entertainment system with a Music Box hard drive, DVD and CD player, and Bluetooth® *2 audio function. For special use in the GT-R application, the multi-function meter also includes mechanical and driving information for safe high performance driving, including acceleration opening, brake pedal pressure, and steering angle. It also includes an “optimal gearshift map,” to emphasise economical vehicle operation. A specially designed BOSE sound system includes two forward-facing woofers in the rear centre armrest area combined with traditional door speakers. All speakers are mounted in rigid aluminium diecast panels, which combined with the design of the system itself, provide sound quality suitable for a super car. *2: Bluetooth® and the Bluetooth logo are trademarks of Bluetooth SIG Inc. of the U.S.